Trump just asked if the military men in front of him are real patriot because no one raised their hand to decline a pay raise to pay down the deficit. This is one of the most insulting things I have heard from this idiotic buffoon. How dare he even joke about the military’s patriotism when he so clearly has demonstrated his own…five separate times? This entry was posted in Facts & Statistics, News & Views and tagged buffon, Cadet Bone Spurs, Draft-Dodger-in-Chief, idiot, insults, military, patriotism, pay raise, slurs, veterans on August 15, 2018 by Ray Buchanan. 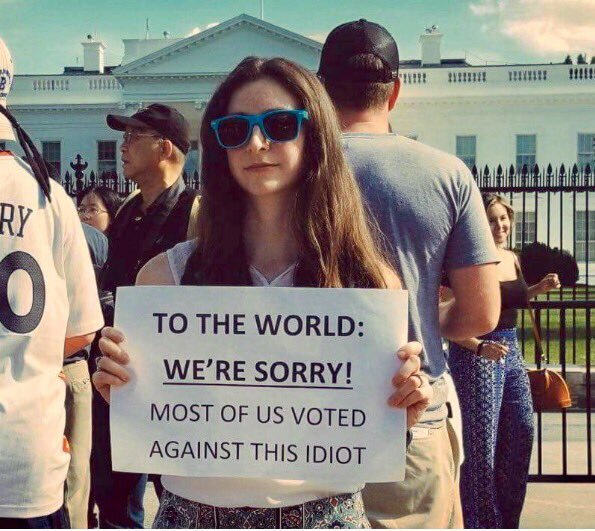 This entry was posted in News & Views, Quotes and tagged BLOTUS, embarrassment, idiot, international disgrace, sad, truth, vote on July 19, 2017 by Ray Buchanan.